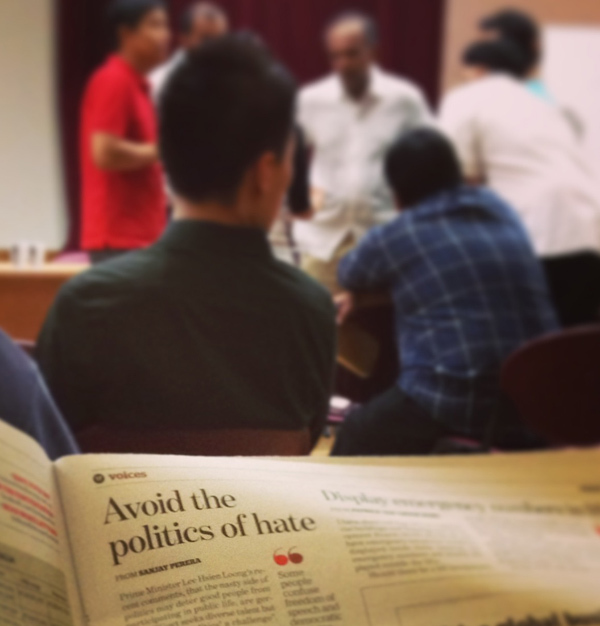 Singapore Politics | Avoid the Politics of hate? Avoid the Politics of hate? Politics is divisive by nature. At least the type of politics that forces a citizen to make a choice once every four years is. I find it very difficult to discuss matters like this with friends without entering the “PAP/WP supporter” territory. So i’ll just pen a few words here and readers can decide for themselves. Some are curious, even astounded at the latest message coming out from the Prime Minister’s Office. With dark irony, you could say they have rained blows from a sledgehammer to crack a nut. To try and keep the co-driver awake. To attack a political party from the highest position of Government could be construed as bullying. But realistically, no matter what position he takes: be it as Secretary General of the PAP, or grassroots advisor – people are going to see his address as coming from the Prime Minister of Singapore. This strong response had followed Worker’s Party Low Thia Khiang’s reference to the PM’s earlier speech, calling for the country to get the country’s politics right. Low said that MEW-R Minister Vivian Balakrishnan’s taunt in Parliament was “not good politics”. The charges laid by Balakrishnan are not trivial either. Members of the Worker’s Party have been called “liars”. Now, this is not casual bickering online between bloggers. Here, a Minister outrightly accused a person of position, authority and stature, of lying and this is not a small matter. The Worker’s Party had demanded that the PAP come clean with AIM – and a full investigation was conducted, complete with a hearing. On the other hand, when asked for an explanation on FMSS, the Worker’s Party made none. No investigation, no explanation. Instead they challenged the Government to launch a CPIB probe on them instead. Clearly, this country has more pressing matters at hand than the cleaning of hawker centre roofs. I’d rather see politicians arguing about raising wages, improving lives, tackling intra-regional hostilities and tell us about how we intend to sharpen our competitive edge against up and rising economies. This is a young country, but it doesn’t mean that we have to partake in juvenile, angst, petty, party politics. And it starts with us, the citizens. We need to show these politicians that we want to attack the issue, not the person and not the organisation – to steer away from politics of hate and emotion, rather of constructivism.